Another fire in Amador and Calaveras counties caused an estimated $300 million in insured losses. That fire killed two people and destroyed more than 800 buildings, making it the seventh-most destructive wildfire to hit the state. 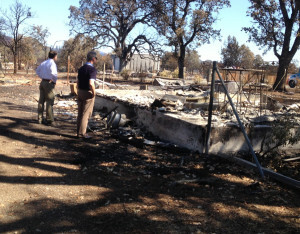 Insurance Commissioner Dave Jones views the destruction of the massive Valley Wildfire in Northern California in September, 2016. This is the first damage estimate from the California Department of Insurance for the fires, compiled from insurance claims filed through December. A final figure is months away. Insurers report they have received 5,600 claims for commercial and residential properties, vehicles and other items. Lake County residents have filed the bulk of claims. Lake County Supervisor Jim Comstock said $1 billion sounds right. The $1 billion does not include uninsured losses nor does it include damage to public roads and utilities. For that, global insurance company Aon Benfield estimated last year that the two fires did nearly $2 billion in economic damage, including business interruption. About $1.5 billion of that was in Lake County alone. Aon reported insured losses for the two fires topped $1.2 billion, including $975 million in Lake County. That’s within ballpark range of the state’s figures, said Aon associate director Steve Bowen. Bowen said the fire in Lake County is the fifth costliest wildfire in state and U.S. history in terms of insured losses. The costliest remains the Oakland Hills Fire of 1991, with damage covered by insurance costing $2.9 billion when adjusted for inflation. The second costliest is a 2007 wildfire in San Diego County that caused about $1.8 billion in damage covered by insurance. The cause of both Northern California fires remains under investigation.